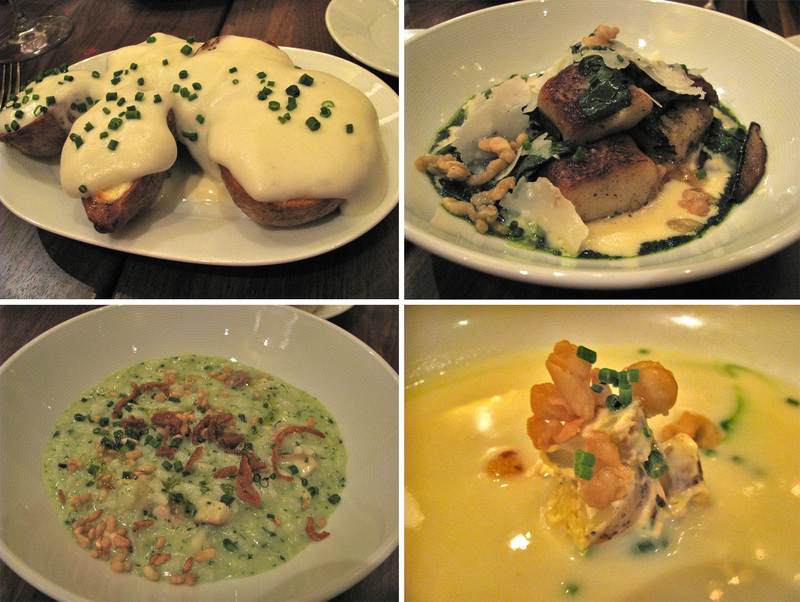 I had so many food recommendations for Chicago, I could have eaten non-stop for several months. Unfortunately, my visit was only two days and therefore merely served to whet my appetite. This was my first visit to Chicago and so, of course, I had to start with some of the basics: deep dish pizza and a Chicago style hot dog. We took two food tours. 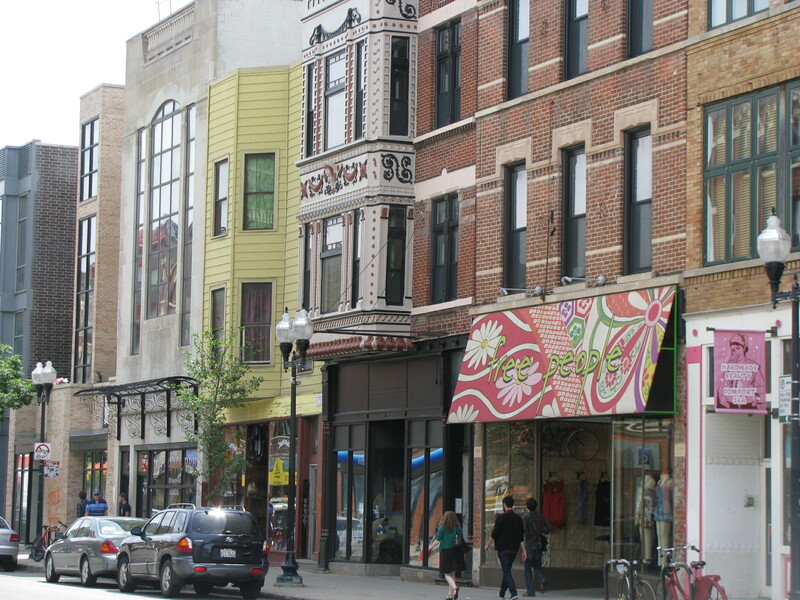 The first run by Chicago Food Planet, was a tour of the Bucktown and Wicker Park neighborhoods and we visited six shops and restaurants, sampling food at each stop as well as walking around the neighborhoods learning about the history and architecture. We started the tour at George’s hot dogs, a neighborhood and Chicago favorite for over 60 years, learning about the history and characteristics of a Chicago style hot dog. 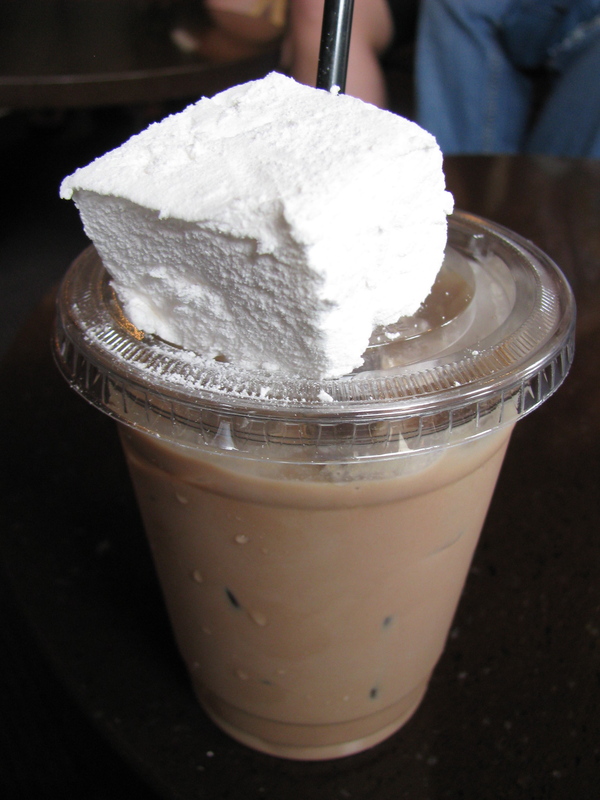 The second stop, and one of my favorites was at Hot Chocolate for cold hot chocolate (aka chocolate milk) with a house-made marshmallow. The owner Mindy Segal has received many accolades and has been nominated for the James Beard award for outstanding pastry chef four times. It was quite easily the best chocolate milk I have had. We visited a pizzeria/ brew-pub called Piece (cleverly named, well crafted beers), The Goddess and Grocer deli (lots of local products – and Jeni’s) and Sultan’s Market (average falafel). The last stop on the tour was probably the coolest (pun intended) – I cream. 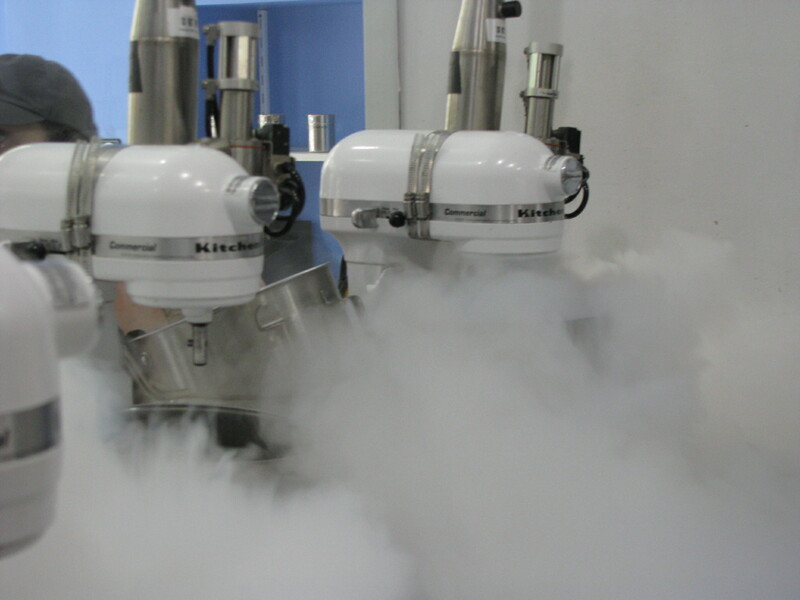 I Cream is a science-fiction-esque ice cream shop where your ice cream is made almost instantaneously before your eyes using a cloud of liquid nitrogen. It takes longer for you to choose from the array of options (base, flavors, mix-ins) than it does for the ice cream to freeze. There are well over 100,000 possible flavor combinations (this is where a guide comes in useful). I had seen i cream on Chefs vs the City on the Food Network, but it was fun to see it in person. My favorite flavor surprised me: cream soda and white chocolate with nutella, a flavor officially known as ‘that guy from Florida’. 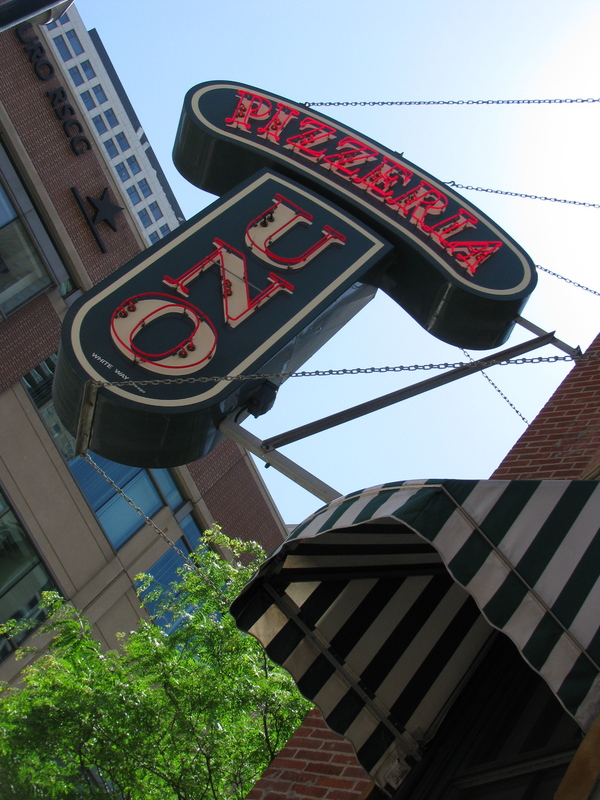 Day two was another tour, this time downtown with the focus on learning about the history of Chicago pizza and run by Slice of Chicago Pizza Tours. Our guide Mark, was a wealth of knowledge on all things pizza, but particularly about the colorful history of Chicago deep dish. We started, appropriately, at Pizzeria Uno. 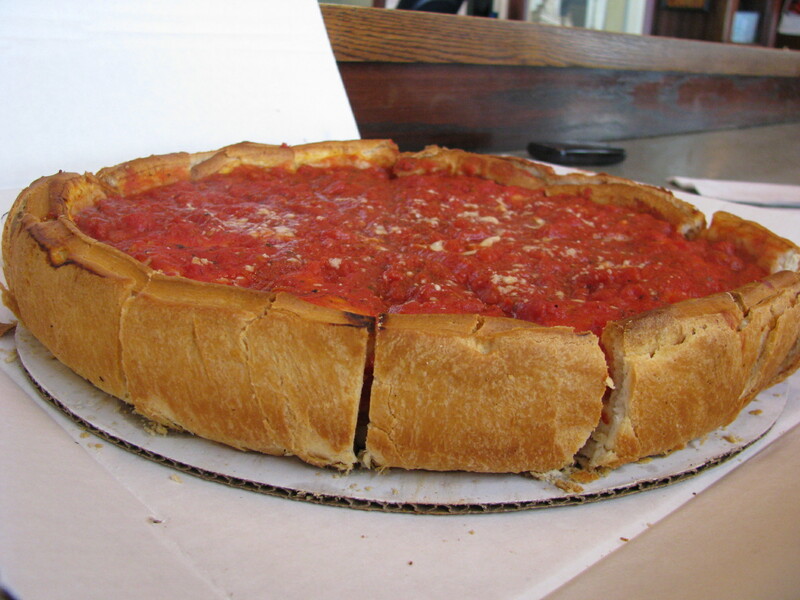 We tasted two different deep dish pizzas, explored the neighborhood and then finished the tour at Giordano’s where we sampled a stuffed crust pizza. 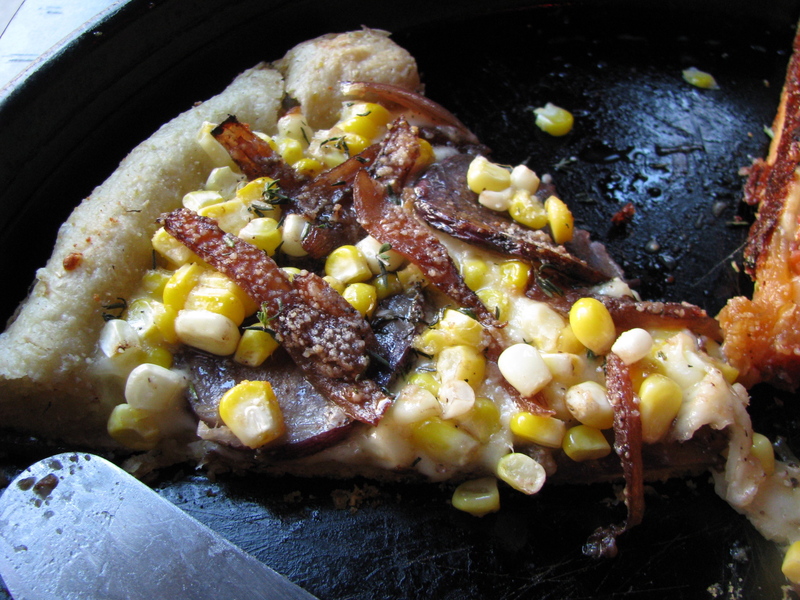 This last pizza, oozing with cheese turned out to be my favorite of the three. We stayed in Oak Park, at a lovely Bed and Breakfast, right around the corner from the Frank Lloyd Wright house and studio. It meant that we didn’t have to worry about parking downtown, could ride the green or blue lines in and out of downtown and also got to explore the neighborhood, which is full of historic houses. We ended up eating dinner in Oak Park both evenings, the first at a modern sushi bar called Sen and the second at a Mexican restaurant called the New Rebozo. New Rebozo was an experience. Chef Paco greets every table and explains the days specials, with plenty of the ‘OMGs’ for which he is notorious as well as descriptions of each dish as the perfect combination of ‘sweet, salty, crunchy, spicy’. 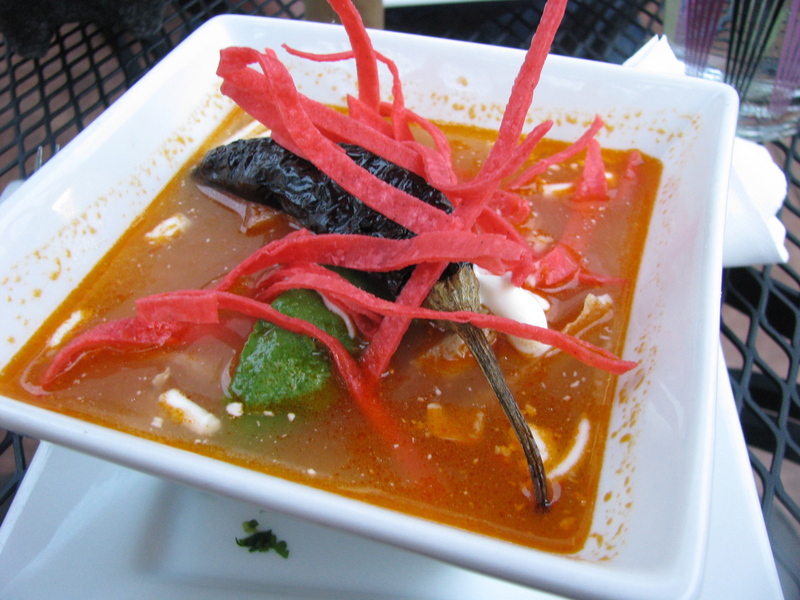 Above is the colorful and excellent tortilla soup, which I washed down with a paloma cocktail (gold agave tequilla, lime juice and squirt). 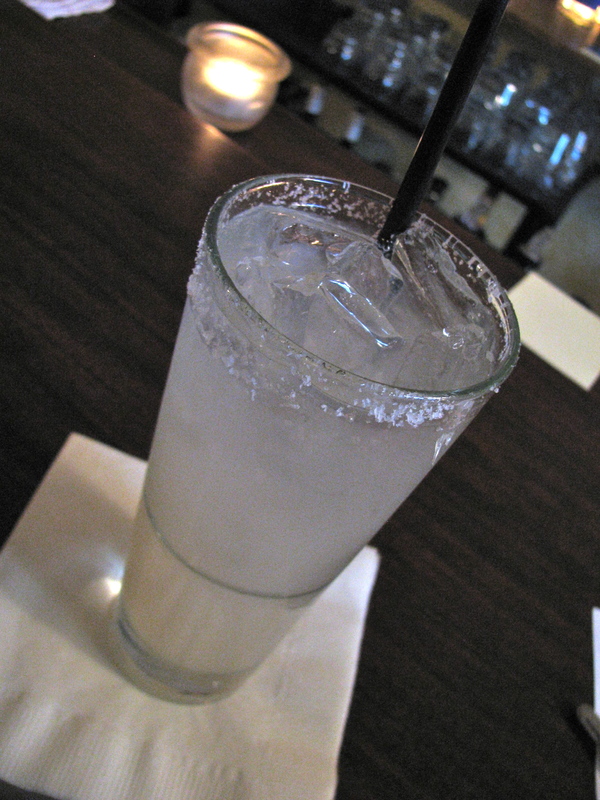 Move over Margarita! Chef Paco makes 14 different moles from scratch and each week offers a choice of 6. The fiesta mole is 6 enchiladas, each with a different mole sauce. It was a fantastic dish and each mole was my favorite, until I tasted the next one. 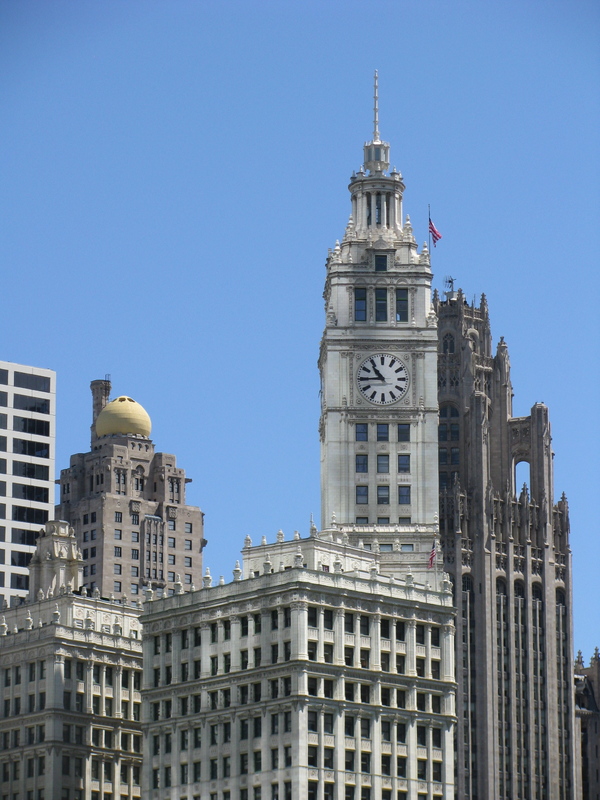 The trip, brief as it was, gave me a taste of Chicago and made me impatient to return. But, it also gave me a renewed appreciation of Columbus and the diversity that we pack in to our relatively small city. 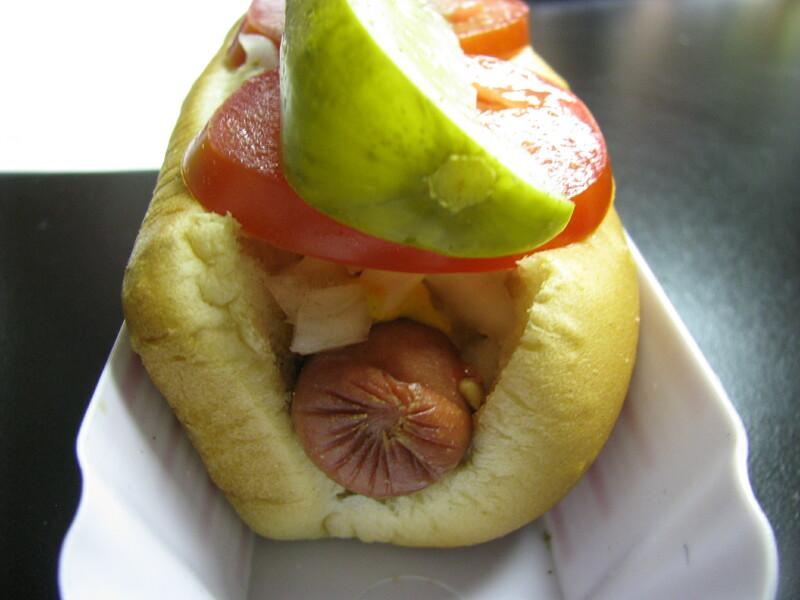 There may not be thousands of hot dog and pizza vendors, but we have some really good ones. 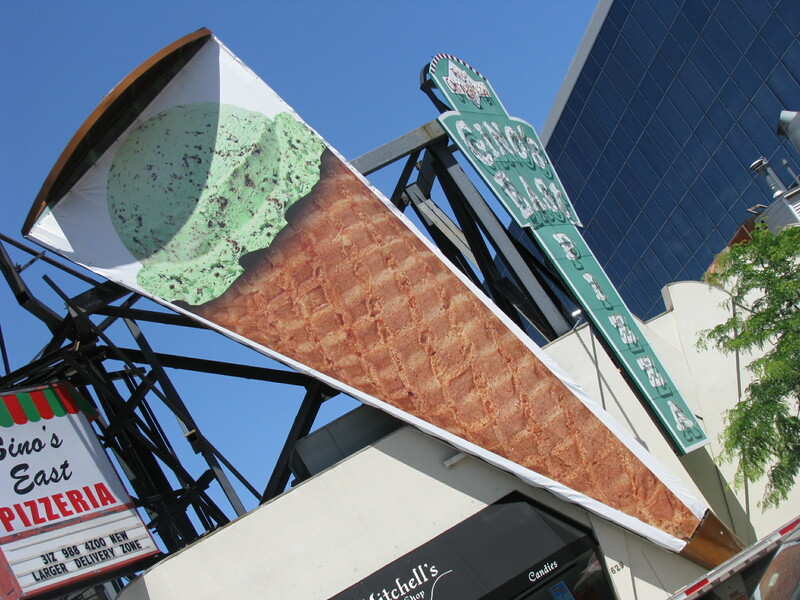 We have all sort of ethnic eats – if you know where to look, and while our ice cream may not be made in an instant, it’s definitely hard to beat. Lots of photos on flickr. As the only working chef in the US who is also a Master Sommelier, Steve Geddes is an anomaly. Achieving the honor of Master Sommelier is impressive enough as there are fewer than 200 of them worldwide, but Steve decided that where he really wanted to be was in the kitchen. He moved to Cincinnati last year and is now head chef at Local 127, a restaurant that opened in the fall of ’09. As well as being so accomplished, Steve is also a genuinely nice guy. Knowing that he was a Master Sommelier, we asked for some advice on wine pairings. Not only was he was happy to offer guidance on wines and answer questions about the menu , but he also talked with us at length about becoming a chef, suppliers, rare breed Ossabaw pigs and even sent out some samples of their amazing copa and lardo. Later, when he saw us peeking into the kitchen he said ‘come on in, that’s why we took off the doors’. Like I said, a genuinely nice guy, and passionate about sourcing, sustainability and the local food economy. Where possible, the food on the menu comes from within a 127 mile radius and Steve tries to support local suppliers as well as farmers by, for example, procuring his spices from the Colonel in Findlay Market rather than purchasing them from a wholesaler. 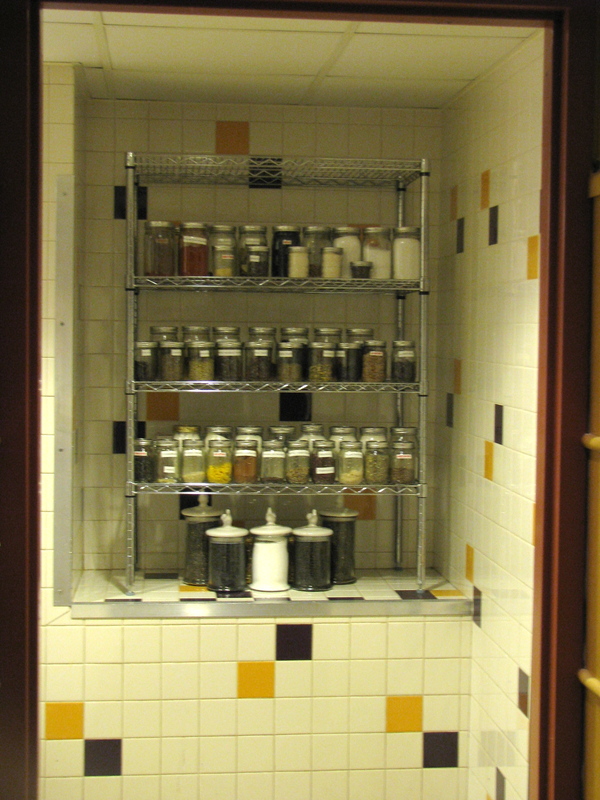 The menu has a ‘cured and pickled’ section with seven house made options to choose from. We went with the chef’s choice, a selection of four of the seven. Clockwise from the top they were smoked chicken with pickled radishes and a Madeira sauce, a velvety smoothy chicken liver pate with Riesling gelée and pickled pears, smoked golden trout from Idaho but house smoked and a pork terrine with picked beans. They were served with thin crispy toasts. 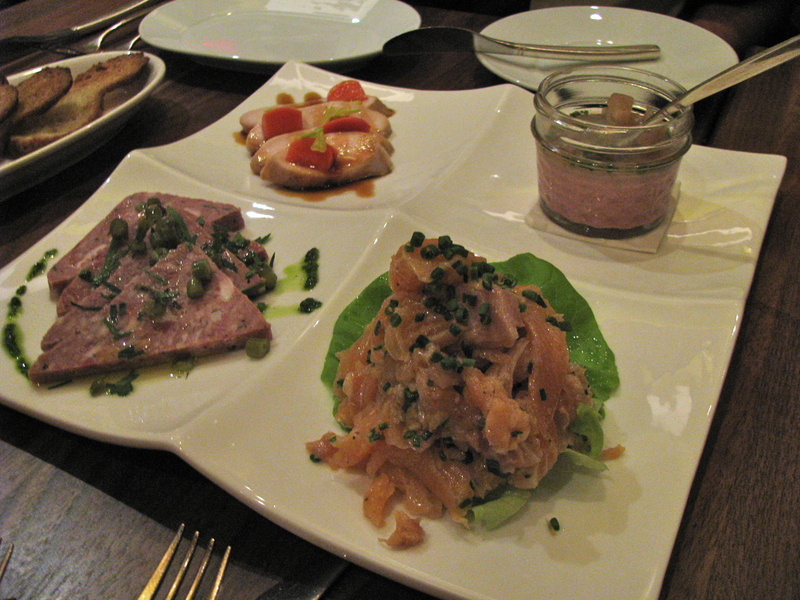 My favorite was the lightly dressed and very moist trout, but I thought both the pate and terrine were excellent too. Only the smoked chicken failed to excite, mostly because the sauce was a little overpowering. 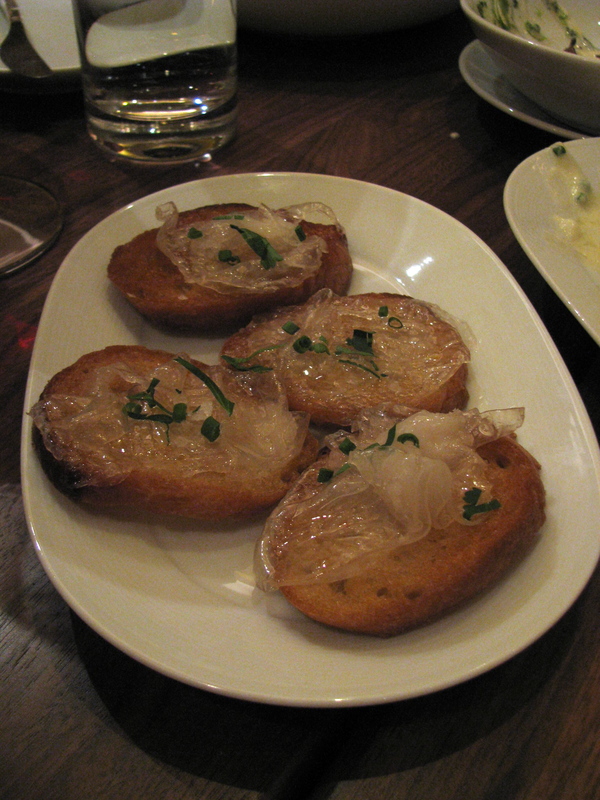 We decided to share some small plates rather than ordering a main dish. First out was potato skins with crispy pork, cheddar and chives topped with a surprisingly light but very cheesy foam (they would be a really good bar snack). Next was sublime house made gnocchi- large, pillowy-soft, pan seared dumplings with buttery sauteed mushrooms, vibrant pesto and salty parmesan which gave the dish a wonderful range of flavors. Both the pan searing and the puffed rice added an appealing contrast in texture. While potato soup sounds like more of a winter dish, this chilled version was refreshing, soothing and surprisingly flavorful. The bowl, sans soup, arrived at the table with a small mound of potato salad and a swirled pattern of green garlic dressing. The soup came separately and was poured from a mason jar by the server. The fourth small plate, a herb risotto with smoked chicken, preserved lemon and puffed rice was another winning dish. The smoked chicken was better utilized here and the dish was light and spring-like, but satisfying. 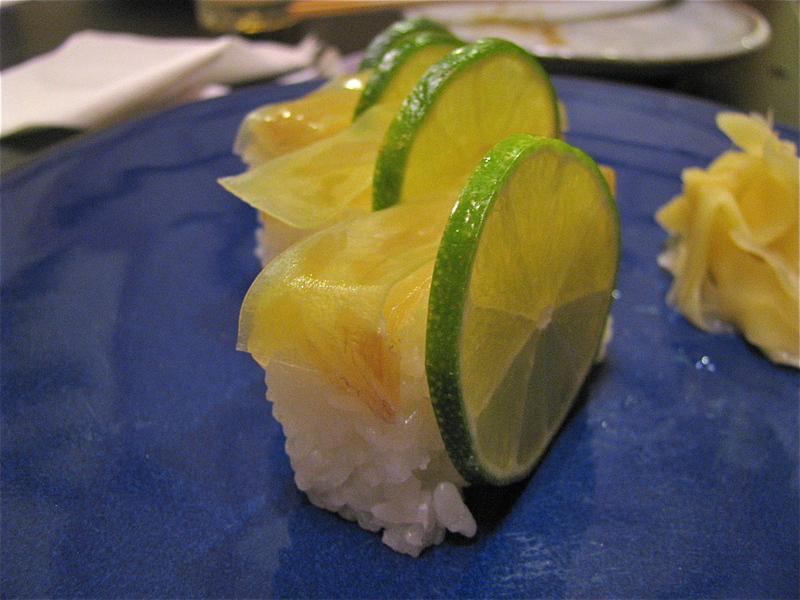 The preserved lemon gave a fragrant citrus aroma. Full as we were it was still hard to resist the lures of the local cheese plate, especially as we had some red wine left. All of the cheeses (Tomme, Barren Co. Blue and Kentucky Rose) came from Kenny’s Farmhouse Cheese in Kentucky and were all new to me. The Tomme was rich and creamy, the Barren Co. Blue was a Stilton-esque tangy ripe blue and the Kentucky Rose was a light, buttery blue. 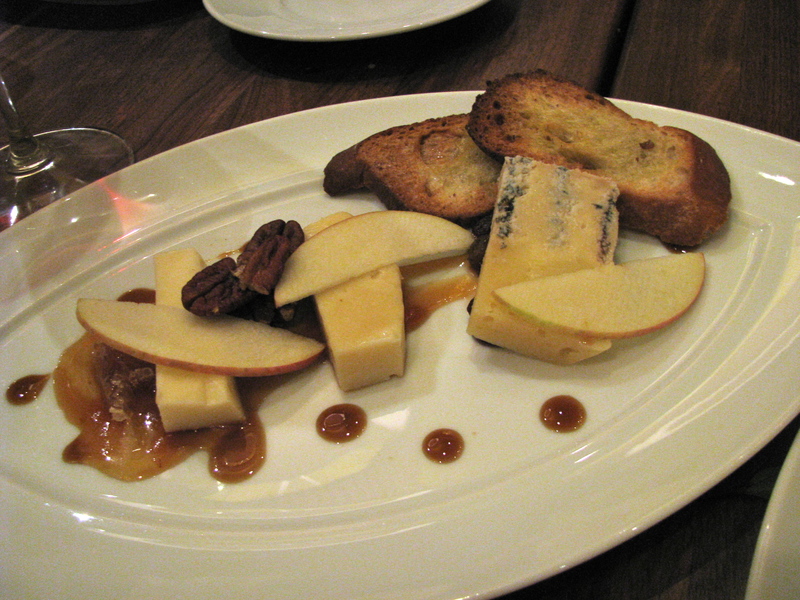 They were served with honeycomb, thin apple slices, pecans and raisins. Overall, it was an exceptional meal. Service was generally very good and my only real criticism of Local 127 is that the decor seems mismatched with its farm to table mission. The menu has a rustic feel both in content and design and the aforementioned mason jar service furthers that impression, but the decor, most of which is inherited, is too polished and has something of a slick ’80s hotel feel. A more eclectic decor, similar to FARM Bloomington would have been a better fit with the ethos of the kitchen. Inconsistent aesthetics aside, Local 127 is definitely worth visiting if you are in Cincinnati. I will be looking for excuses for another trip soon. 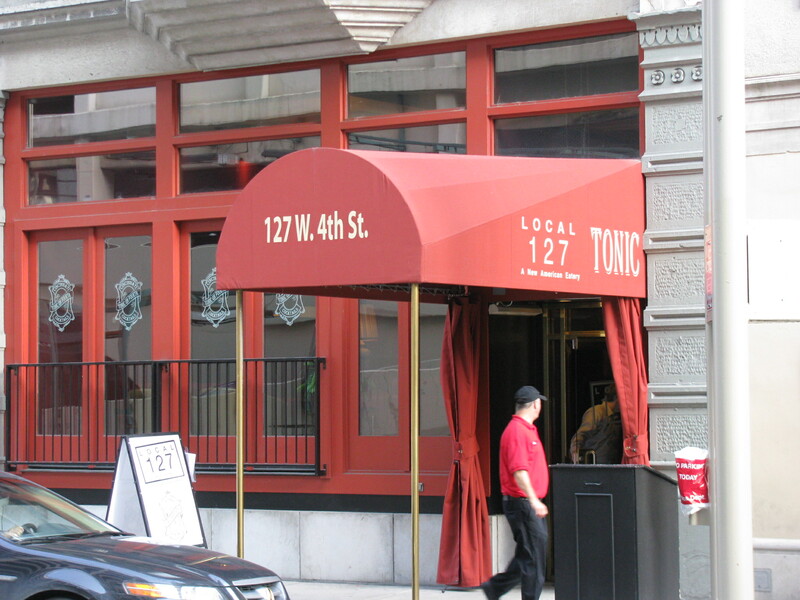 Also noteworthy was the attached bar named Tonic on Fourth which has an interesting cocktail and punch menu. They make a lot of their own ingredients such as bitters, grenadine and ginger liqueur. 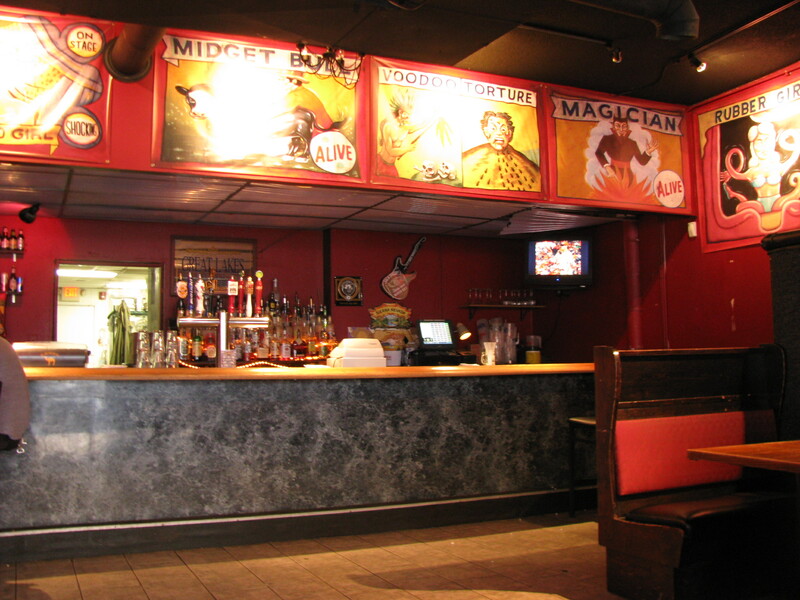 There is also a limited selection of food available in the bar. I have to admit a weakness for food that is cooked or finished at the table. Whether it be a dipping bread into a steaming pot of melted cheese, wedge shaped raclette creations or just assemble-it-yourself crispy duck pancakes, I love the conviviality of sharing food with friends and the freedom to play with your food. Do-it-yourself dinners allow you to experiment with flavors and to customize each bite. I also love the less interactive and more spectacular teppanyaki tables. As a teenager my birthday wish was usually a visit to Benihana, not just because the food was delicious, but because I always enjoyed the show. 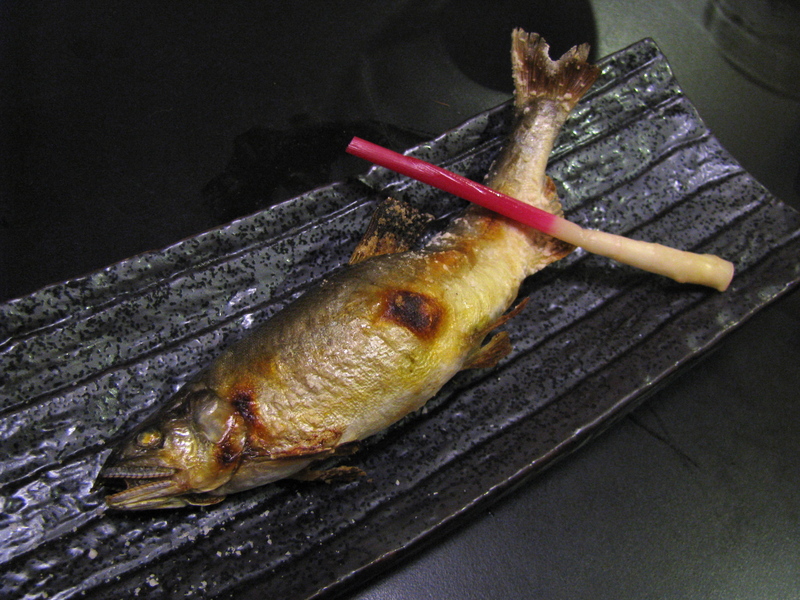 When I saw the barbecue tables on my first visit to Kaya, I was intrigued by this new variation on table top cooking. 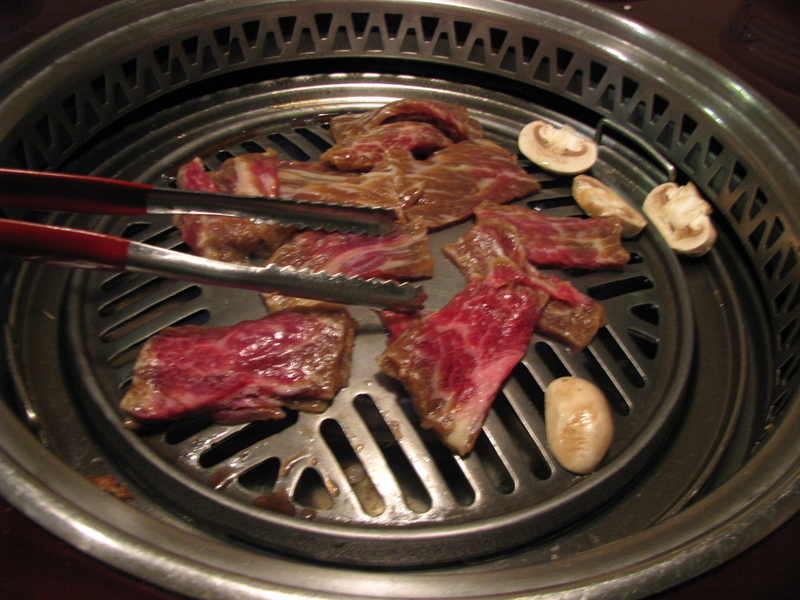 Although I have eaten bulgogi and kalbi, I had not experienced Korean barbecue. 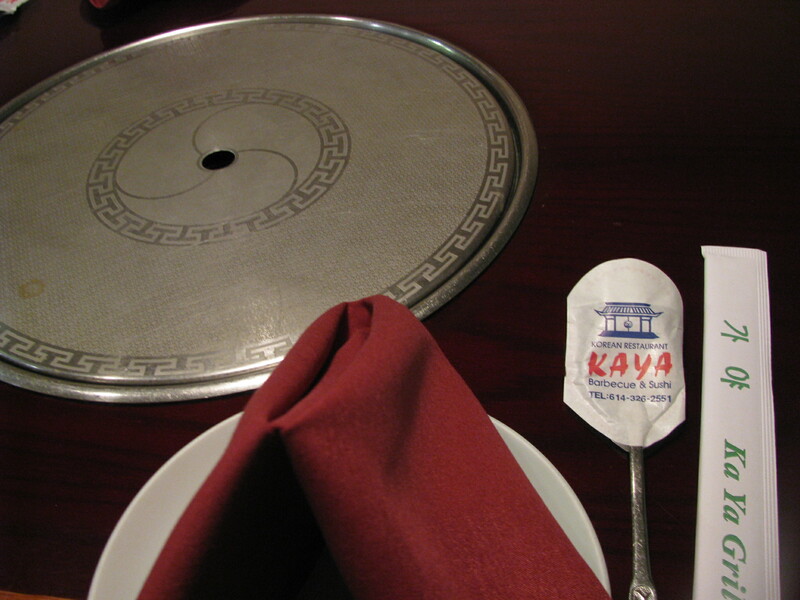 At Kaya the gas grills are inset into the center of the table, and covered with a flat metal cover when not in use. The grill surface is removable and ours was changed out between different dishes. The barbecue section of the menu lists about 10 different barbecue options and we tried a seafood mixed grill, kalbi (beef short ribs) and pork belly. 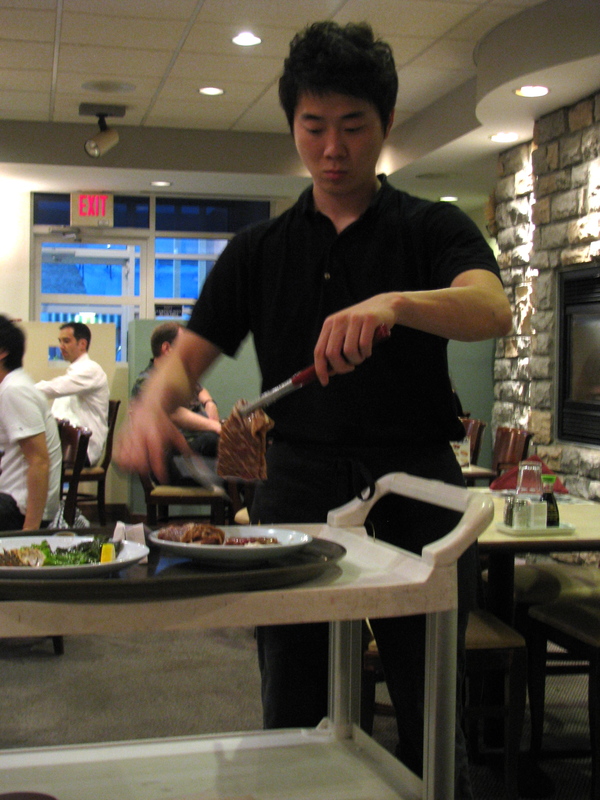 The cooking was mostly done by the servers, slightly awkwardly as they had to reach over the long table. Occasionally we were left to our own devices. Above you can see one of the servers cutting the short ribs off the bone. The server gave us a fairly cursory explanation of how to eat the barbecue and I was glad that I had done some reading beforehand. 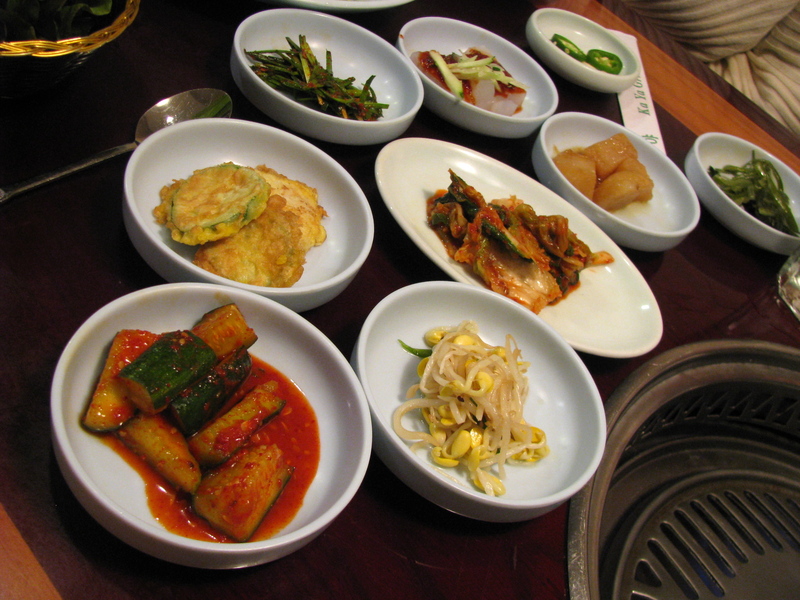 The table was filled with an array of banchan (side dishes) as well as the various accoutrements for the barbecue. We were provided with a large pile of lettuce leaves and for the seafood and kalbi we were advised to take a lettuce leaf, smear on some fermented soy bean paste, dip our meat/ fish into the salt and sesame oil mixture and place it onto the lettuce leaf. Add some of the salad, roll and eat. Kimchi was an optional extra. The salad was one of my favorite parts of the meal. 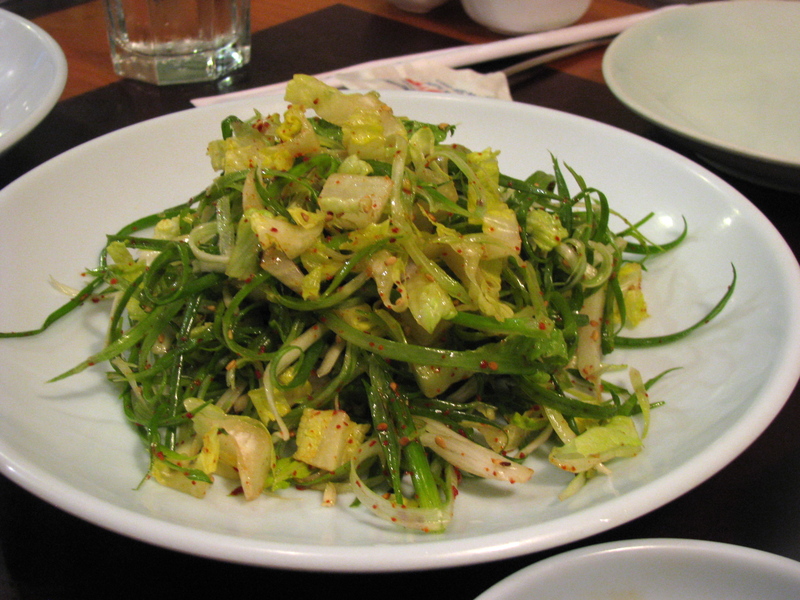 A variation on pajori (scallion salad) it contained slivers of scallion, thinly sliced lettuce and a dressing which included liberal quantities of sesame oil, sesame seeds and Korean chili powder. I would happily have eaten a plate of it and will definitely try making it at home. As a result my overstuffed rolls were somewhat ungainly to eat. The pork belly was a slightly different routine. 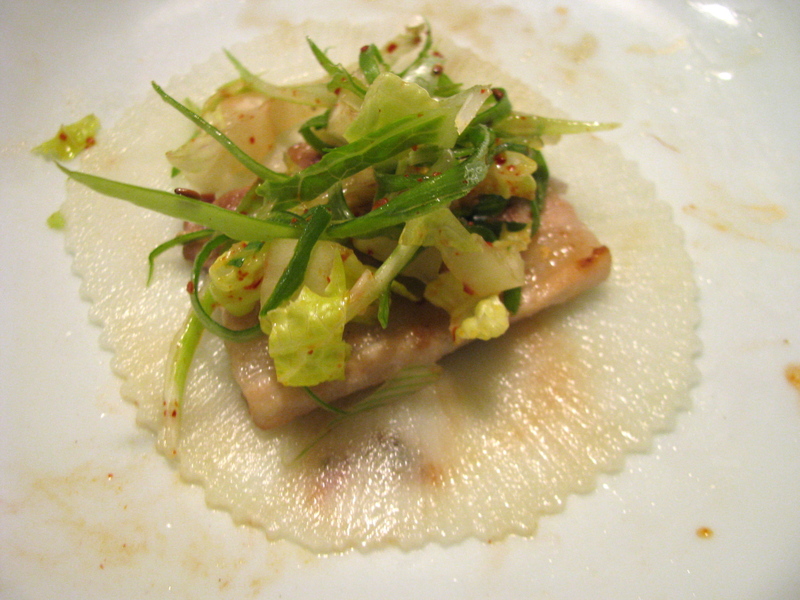 Instead of lettuce leaves the wrapper was thinly sliced pickled daikon. The sweet pickle was a good counterpoint to the fatty pork belly. While I obviously appreciated the DIY approach at the table, there seemed to be a downside: with all the dishes, the proteins ended up on the wrong side of chewy. Was this due to our inexperience, our server’s lack of attentiveness, insufficient marinade, the heat of the grill, or a combination of all of the above? 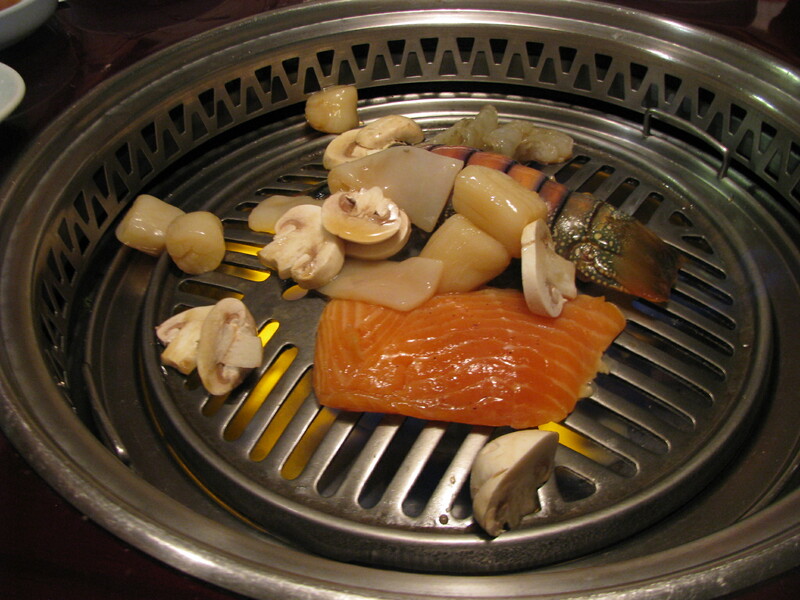 I’m glad to have had the experience of Korean barbecue, but next time I might just let the chef do the grilling. This was the first in what we hope will be a series of dinners featuring unusual dishes and ingredients. 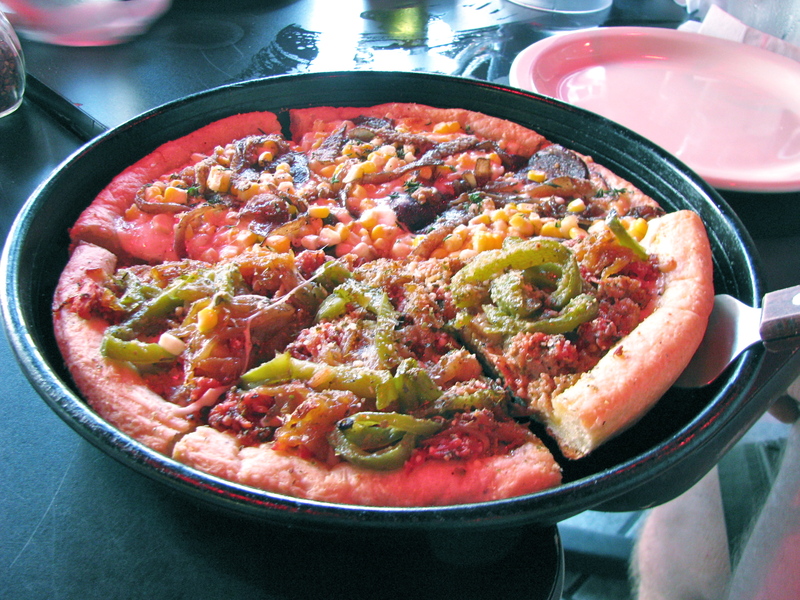 Restaurants often shape their menus around the safe choices of what sells well. We hope to give chefs an opportunity to prepare dishes that they would not normally feature, either because they include less popular or unknown ingredients or because their preparation is too involved or impractical for à la carte ordering. 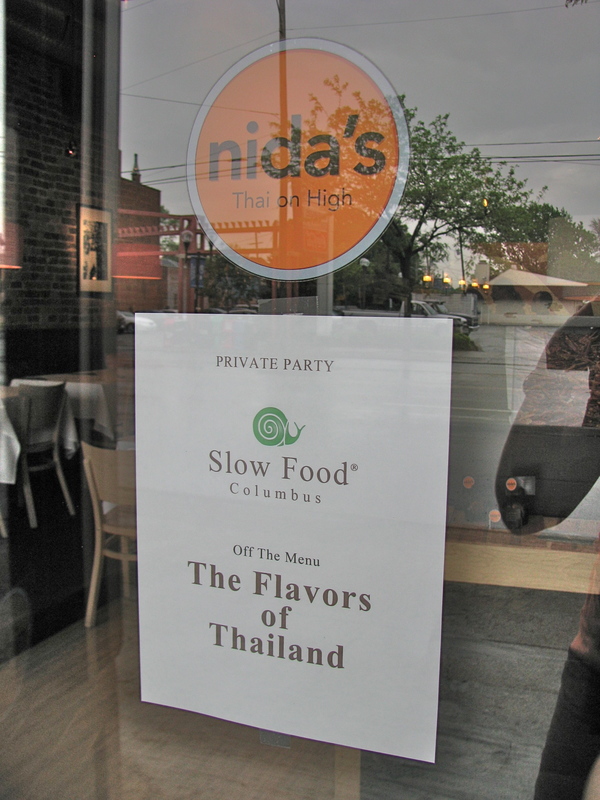 The first of the series Flavors of Thailand was held at Nida’s Thai on High and featured dishes from two regions of Thailand: Isaan and Central Thailand. Many of these were dishes that the chef prepares for herself and the staff. 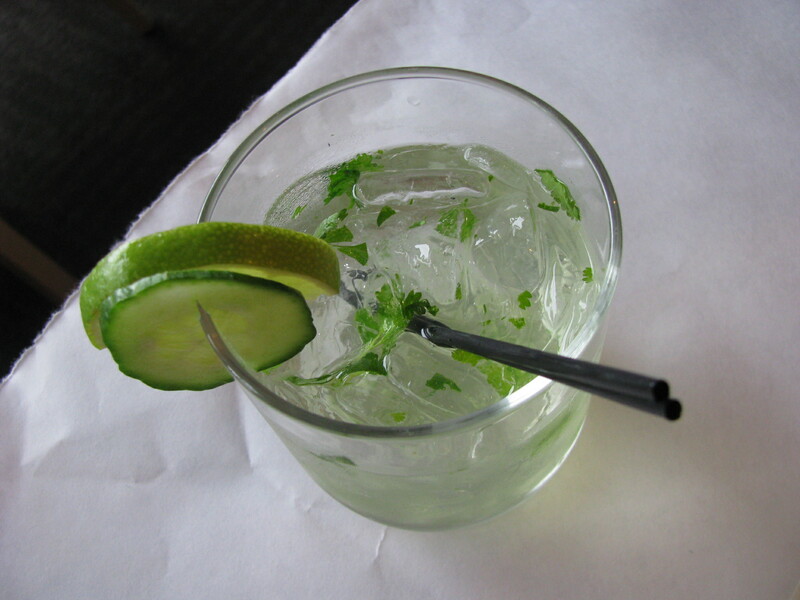 We were greeted by a choice of two of the new spring cocktail specials, either a cucumber cilantro gin and tonic evocative of spring, or an as-yet-unnamed concoction of Cointreau, brandy and orgeat. Such creative cocktails are the specialty of bartender extroardinaire, Vivian Loh. The first course, confusingly named, soup no mai, was in fact not a soup but a spicy (and pungent!) 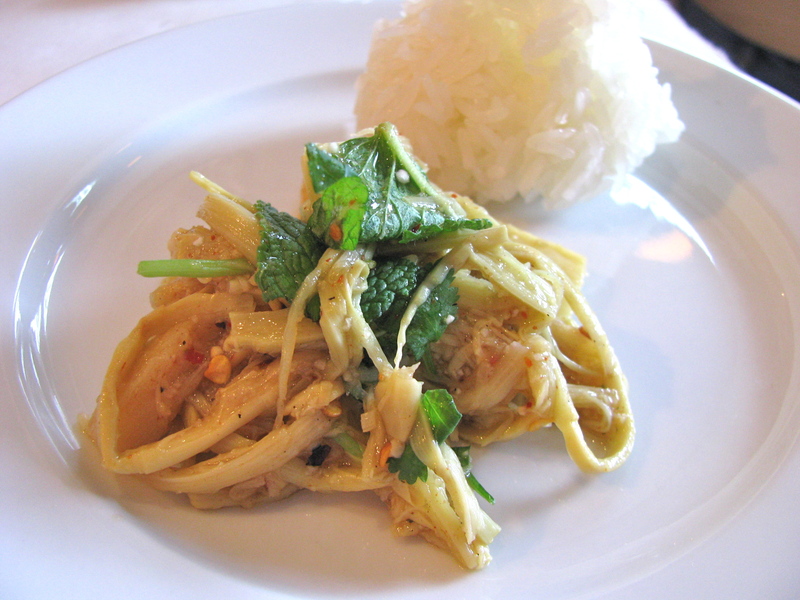 bamboo shoot salad served with sticky rice. Once you got over the initial funky aroma, it was an impressively well balanced dish, with mint as a refreshing counterpoint. It was very well received. The kor moo yang was unanimously the most popular dish of the evening. 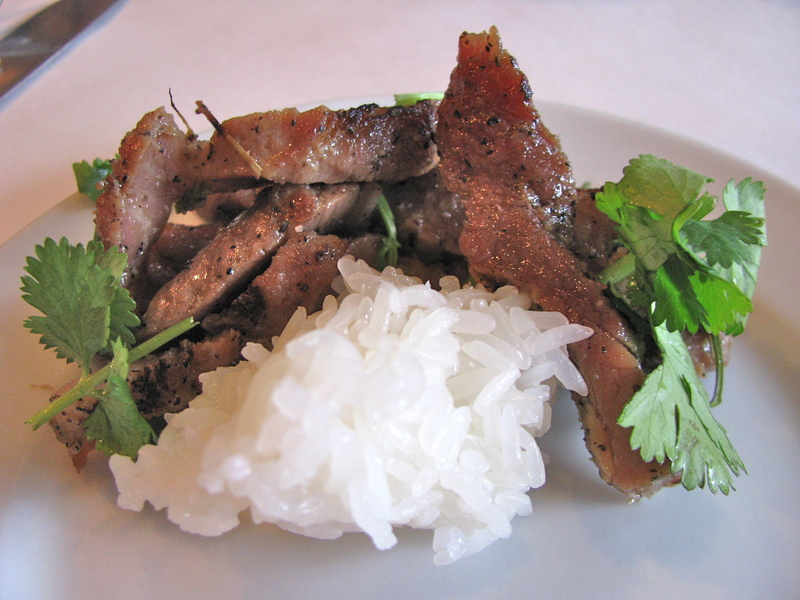 It was marinated, grilled pork collar served with a spicy dressing and a side of sticky rice. Tender and extremely flavorful with a little char from the grilling. The staff quietly thanked us for giving them the chance to indulge in this special treat. 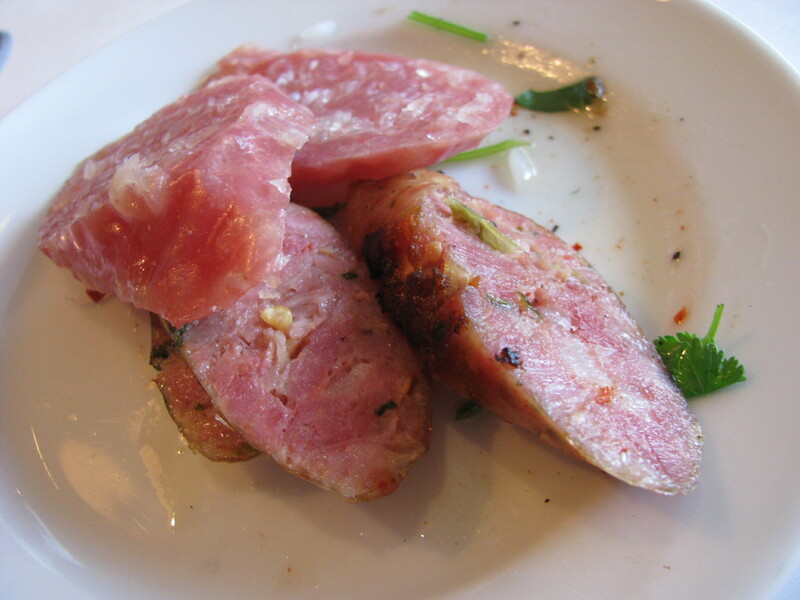 More pork – this time in the form of sai grog isaan, sour Isaan style sausage, and namm preserved pork. The sausage made with pork and sticky rice was well seasoned with spices and garlic. The preserved pork was one of the more challenging dishes, packed with very thin strips of skin and quite chewy as a result. It had taken the chef a week to make these sausages for us, with a lot of effort put into sourcing the authentic ingredients. 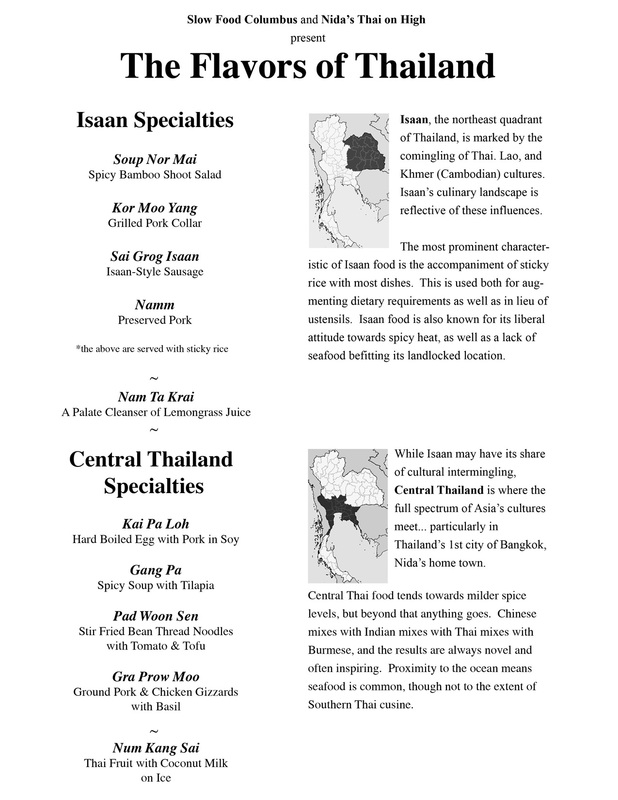 The sai grog isaan was definitely the more popular of the two, although the preserved pork did have its fans. The end of the Isaan dishes was marked with a palate cleanser of lemongrass juice. Sweet and not citrusy as one might think, it was fun listening to people trying to describe the taste – everything from nutty to floral to Fruit Loops(!) came up. One guest said that it was exactly the same as lemongrass juice they had bought on the street in Thailand. Expecting the Central Thai dishes to be less spicy we had a bit of a surprise when we tasted the soup. It was easily the most spicy dish of the evening. 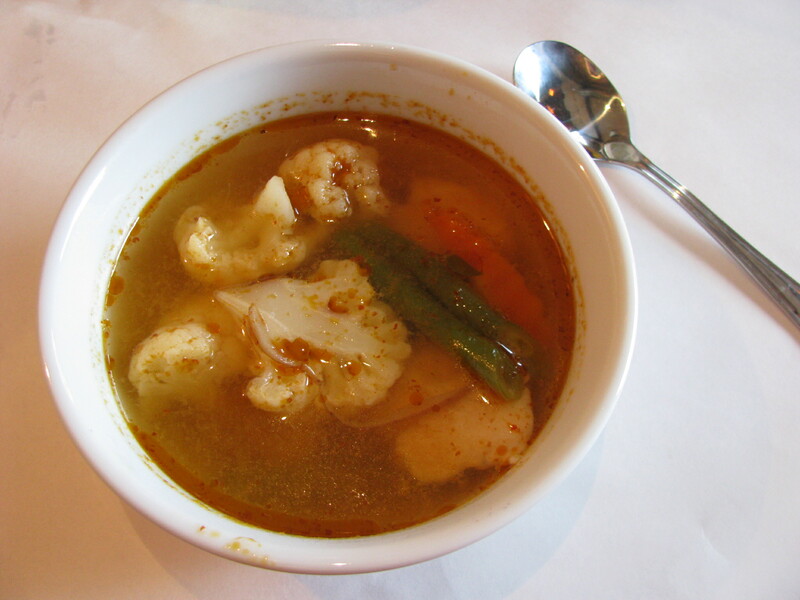 Tender chunks of tilapia, cauliflower, carrot and green beans floated in a fiery, but delicious broth, that rewarded those that braved the heat. Next up Gra Praw Moo. I don’t think I have ever seen chicken gizzards on a menu and there really was only one word to describe them – chewy. 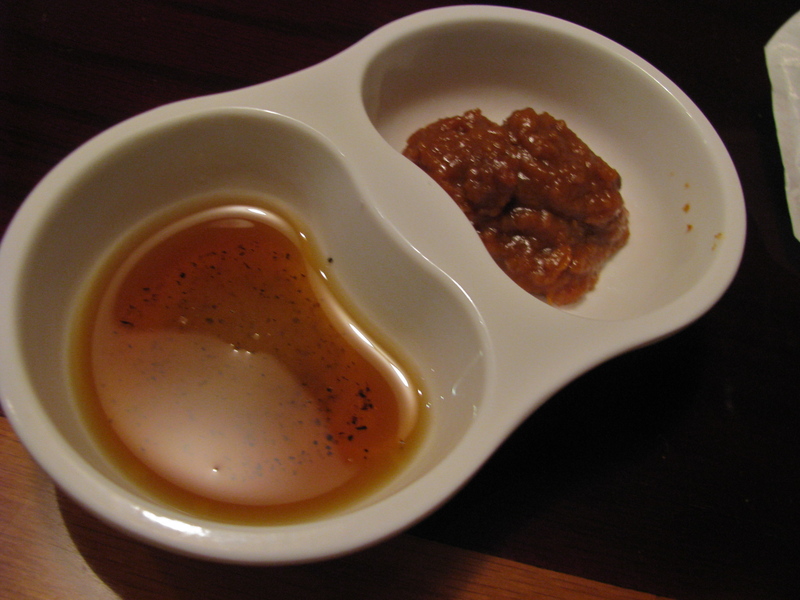 The slightly liver-y flavor was reminiscent of Thanksgiving gravy. 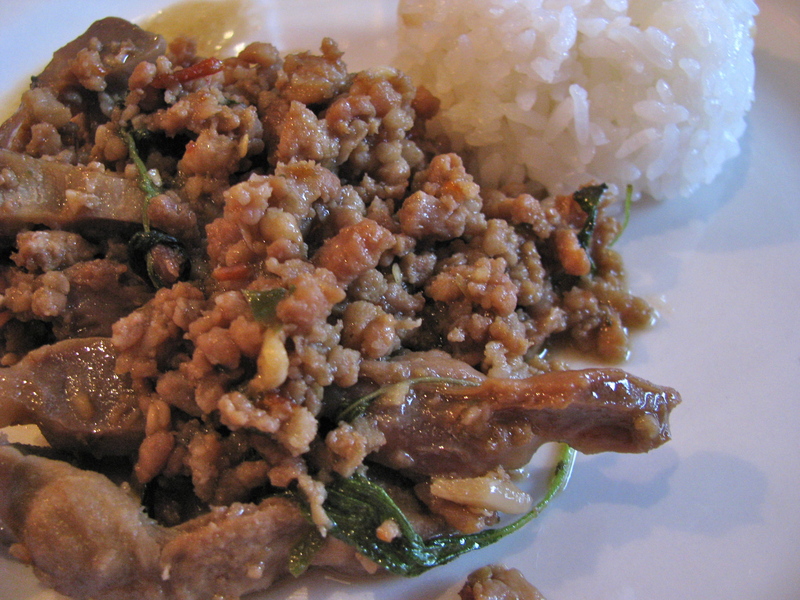 The real reward for all that chewing was tender and tasty ground pork flavored withThai basil and aromatic spices. 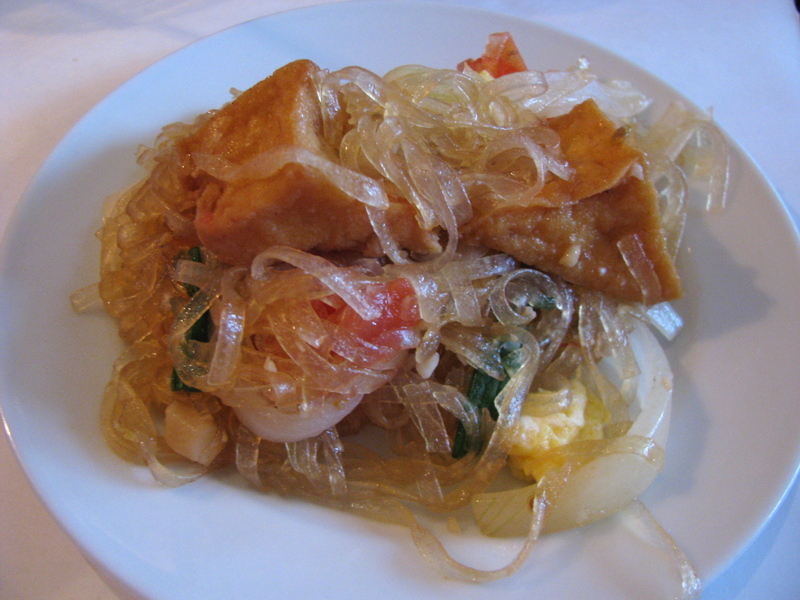 The pad woon sen (bean thread noodles with tomato and tofu), was one of the simpler dishes. By this stage we were approaching the dishes warily, but there were no strange animal parts hidden in this one. By the time we reached course number seven, waistbands were feeling tight. 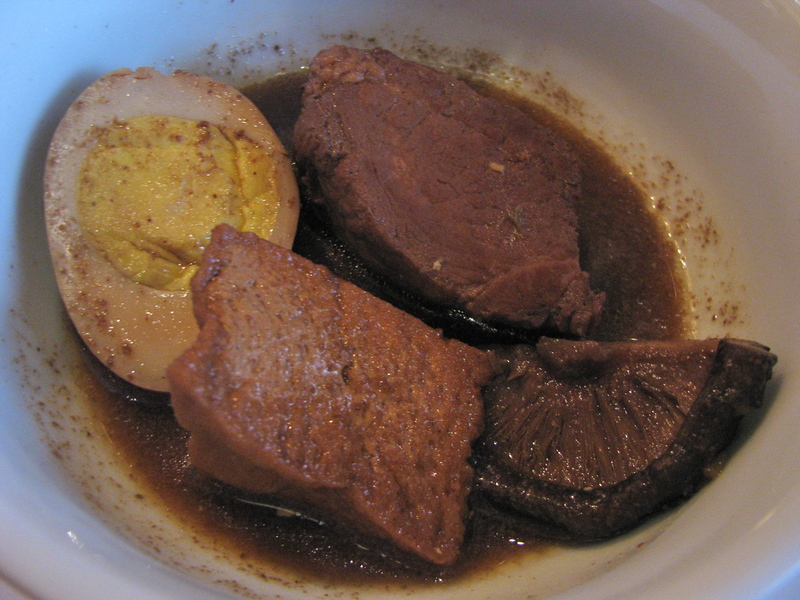 The kai pa loh was a rich stew, fragrant with chinese 5 spice and soy sauce containing melt in the mouth tofu and pork, hard boiled egg and shitake mushroom. 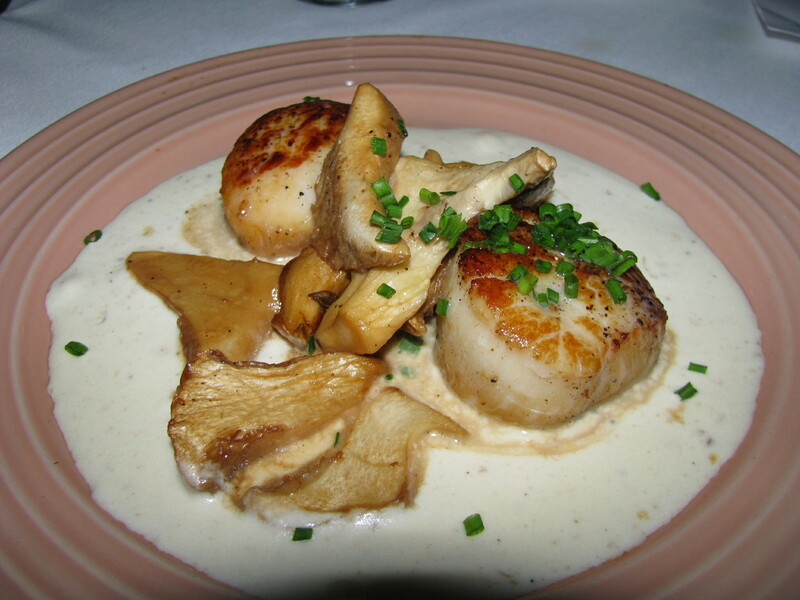 This umami lover’s delight was a wonderful dish. 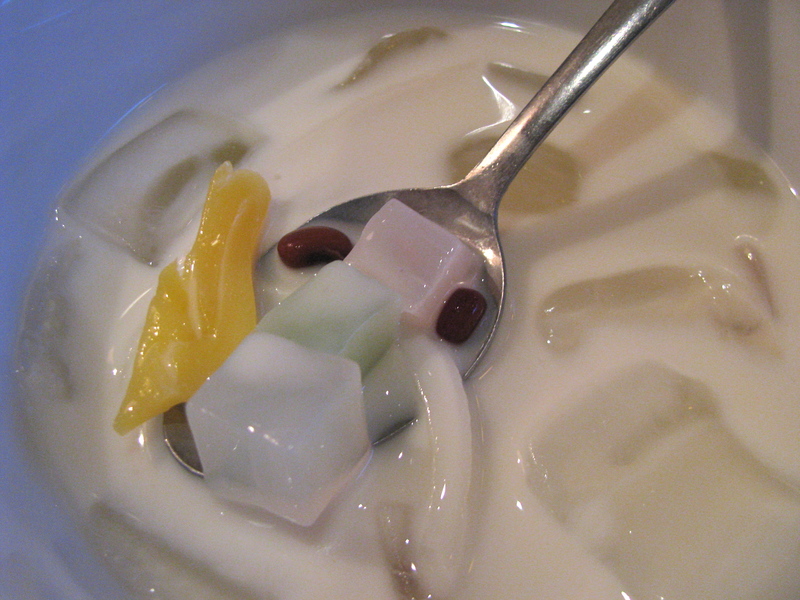 Dessert was num kang sai, Thai fruit and some red beans with coconut milk on ice. It was a simple, refreshing and popular end to the meal. Many thanks to Nida, her chef and staff. 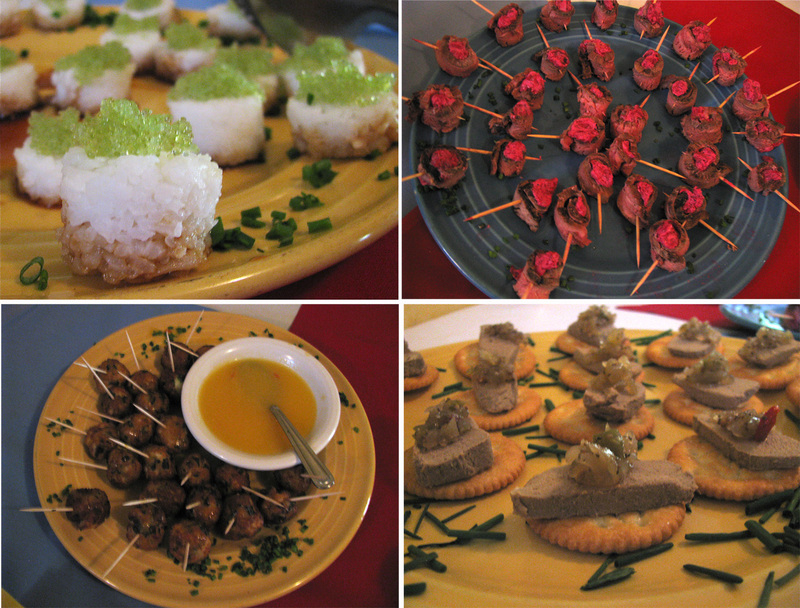 We are very grateful to them for hosting this wonderful dinner and sharing these dishes with us. If this is indicative of Off the Menu events to come, we are really looking forward to future dinners. 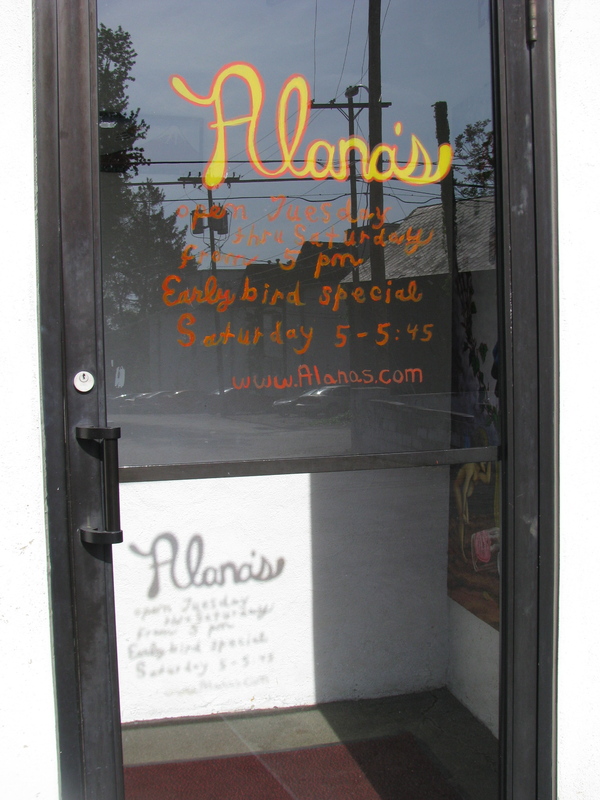 If you would like to attend future Slow Food events please check the Slow Food Columbus website.